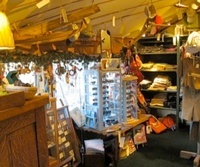 North Shore Trading Company is on the north shore of Big Bear Lake in the town of Fawnskin. We offer canoes, kayaks, stand up paddleboards, paddling gear, climbing gear, clothing, footwear, cabin decor by local artists and more. 3 miles east of the dam on North Shore Drive (Hwy. 38) or 4 miles west of Stanfield Cutoff on the north shore of Big Bear Lake.